The Custard TV: Raised by Wolves: BBC1's loss is Channel 4's gain. 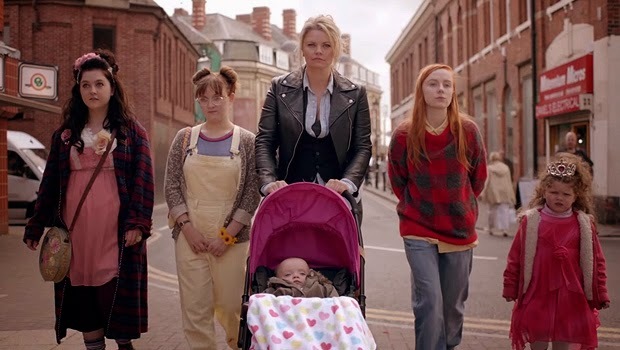 Raised by Wolves: BBC1's loss is Channel 4's gain. There are times when we all need to eat humble pie and this is definitely one of them. After 2013’s disappointing pilot I greeted the news that Caitlin and Caz Moran’s sitcom Raised By Wolves was to be given a full series by Channel 4 with all the enthusiasm of Jeremy Clarkson being told the kitchen’s closed. I was not hopeful. In fact I was downright cross. How wrong I was. The Moran sisters, alongside a storming cast, have created something brilliant. Raised By Wolves is a counter-cultural joy, inspired by the Morans’ 1990s upbringing in a Wolverhampton council house with their four siblings and one extraordinary mother. The action focuses on Germaine and Aretha (Caitlin and Caz’s teenage alter-egos played as ‘two sides of the same brain’ by Helen Monks and Alexa Davies) as they tumble through the agonies and ecstasies of teenage life in a modern day Midlands. For the outrageous Germaine this focuses heavily on lusting over meathead Lee Rind (Kaine Zajaz), for Aretha it’s mainly Proust and Solzhenitsyn. To think that the BBC turned Raised By Wolves down because they ‘already had a sitcom about a woman that year’ is astonishing. This 1970s attitude means that, for every Uncle, the BBC are often lumbered with 1970s comedy (see Paul Whitehouse’s Nurse for comparison – Raised by Wolves makes it look like the dinosaur it is). Determined to prove that ‘there could be more than one funny woman a year’ Caitlin and Caz have created a little gem, a sitcom that wears it colours proudly and has its face turned firmly to the sky. The series kicks off with ‘the other sister’ Yoko (Molly Risker) getting her first period (cue delight from the wide-eyed Germaine as she makes Yoko watch Rambo: First Blood and other period-related films such as The Hunt For Red October) and the hard-up family foraging for their dinner in a Wolverhampton park. Raised By Wolves is so idiosyncratic that it could easily fall on its face, however director Ian Fitzgibbon and the cast have translated ‘Moranism’ perfectly. They make you wish you were raised in a working class Midlands family too. While the young cast are excellent as the oddball sisters, and Phillip Jackson marvellously heroic as the horny Grampy, the star of the show by some distance is the fearsome matriarch Della, played with ferocious strength by Rebekah Staton. Staton has always been a good comic actress but in Della she has given birth to a wonderful monster. Deciding early on in rehearsals that Della should be played ‘like Clint Eastwood in a council house’, Staton has crafted a comic creation that deserves to endure. Dominating the screen like Clint with a bad head, Staton is a tour de force, delivering lines that lesser actors would have made a meal of with Shakespearean aplomb (some of them are long lines). Her instructions on how to eat a Toblerone will take some beating for guffaw of the year. Not everything works. Some lines fail to hit the mark and one or two verbose speeches could do with reining in. And no doubt – just like its famous co-creator - it’s quirkiness and, at times, obtuse wordiness will turn some off. However this is a show with enough panache and come-and-have-a-go boldness that, for those on board, it could get away with nearly anything. Caz Moran wanted to create a show that comedy fans would love. Caitlin wanted to show teenage girls another role model beyond the archetypal lip-glossed, boy-fancying beauty and to celebrate the counter-culture in society. They’ve done both. A group of very funny women have shown the BBC exactly what they’re missing.